This is my project to create a simple MIDI pattern/step sequencer on Mac OS X using Cocoa and Objective-C. It is far from finished and will surely contain bugs, but still it is already quite usable. It requires Mac OS X 10.4 and some kind of MIDI synthesizer. If you don't have MIDI hardware, you can use a software synthesizer like Pete Yandell's excellent SimpleSynth. 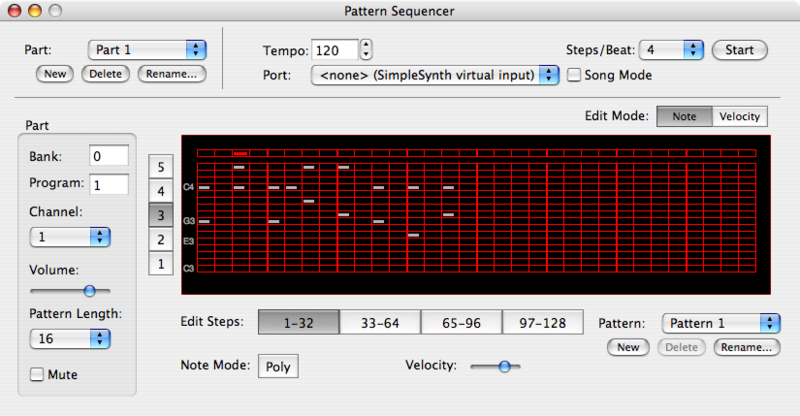 PatternSequencer features up to 16 parts, each of which can have 8 different patterns. You can set MIDI channel, volume, bank and program number for each part. Patterns can be up to 128 steps long. Timing can be 4, 8 or 16 steps per beat. Notes are edited on a 32x16 matrix. A note can span multiple steps by dragging the mouse. Patterns can be looped or arranged as a song. This is done in the "Score Window" where you can specify which patterns should be played in a certain sequence.